"BUTTERFLIES?!" exclaimed my grandmother in 1953. "Very pretty, but what are they FOR?" The answer appeared in 1990, when the authors of the current paper, myself and Camille Parmesan, stopped on the spur of the moment at the "Chapel of the Bells" quickie wedding shack in Tahoe. Part-way through his speech the reverend said "in the light of….." and stopped abruptly, evidently forgetting whether we had asked him not to mention God (we hadn't). Collecting his wits, he continued…. "the interconnectedness of all things," causing Camille to collapse in happy laughter. We are ecologists, what could be more appropriate? Plus, we had an answer to gran's question. Of course, butterflies are for discovering the interconnectedness of all things! 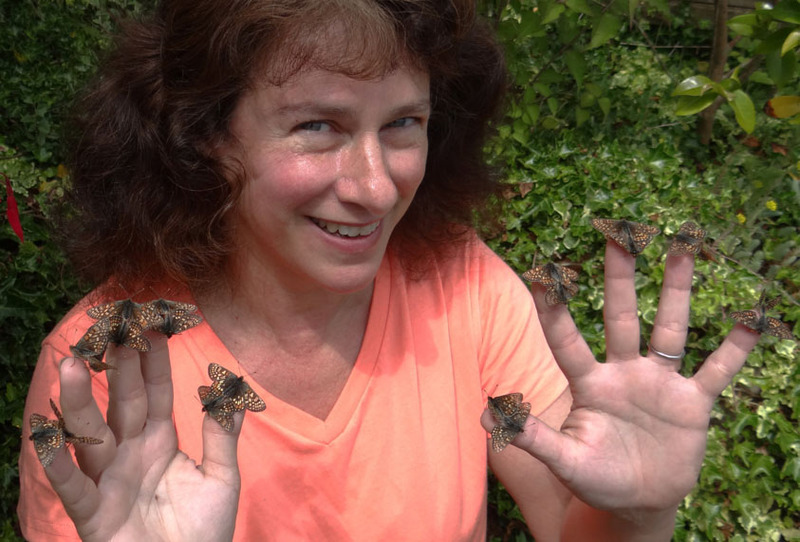 Not all at once, or we'd be out of work, but at a reasonable pace, in the spirit of which our paper describes research on evolution of diet in Edith's checkerspot butterfly that Larry Gilbert and I began in 1968 as students of Paul Ehrlich at Stanford, and that Camille joined in 1982. How did a Yorkshire boy get to Stanford? Forced to walk to school in shorts irrespective of the weather, I half-froze in the winter mornings. Around the end of March I would pass the first butterfly of spring, always a tortoiseshell (not much butterfly diversity in northern England!) sitting on a rock and shivering just like me, a beautiful harbinger of the coming partial relief from cold and damp. "Welcome to Stanford! We will waive the GRE requirement, pay a fellowship to support you, and smooth every obstacle in your path. We look forward to your arrival." My immediate thought was "how much nicer Americans are than the stuffy British!" followed by "Stanford must be no good at all, if you can get admitted by writing a one-page letter." I asked my tutor, who had never heard of Stanford. 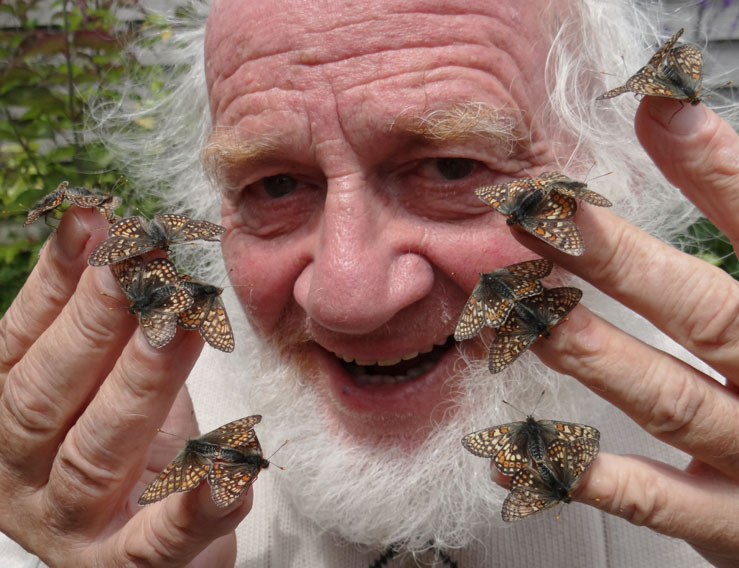 Neither had the next 3 people I asked, until I came to the aforementioned Larry Gilbert, a Texan butterfly enthusiast spending a one-year Fulbright fellowship in Ford's lab prior to starting a PhD at Stanford with Ehrlich himself. What a happy coincidence! Larry assured me that, despite being unheard of in Oxford in 1966, Stanford was OK. I accepted Paul's offer, later to discover that he had been trying for years, without success, to persuade students and postdocs to work on the larval ecology of Edith's checkerspot. When he got my letter he came charging into the coffee room sounding less nice than in his message to me: "Jesus Christ! There's a nutcase in Oxford WANTS to do that project! Boy, am I going to TIE him to that!" As a result of writing that one-page letter, I've spent 50 years studying the interconnectedness of Edith's checkerspot with its host plants. Females choose to lay their eggs on different plants at different sites, even when those sites support apparently identical plant communities. 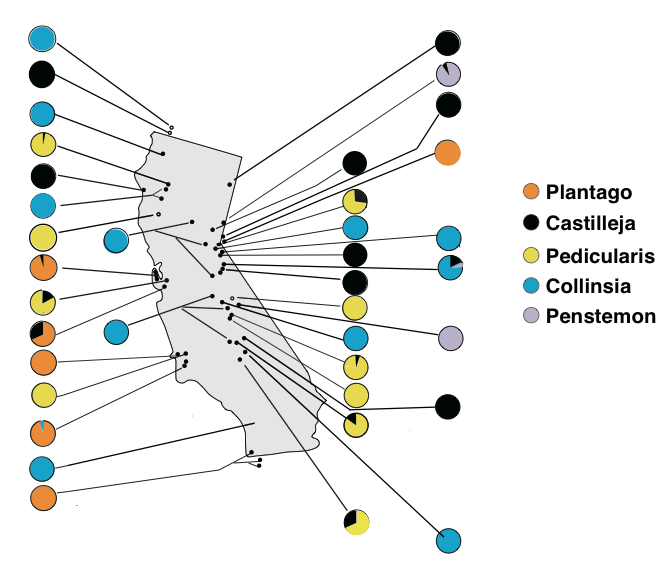 The map shows the spatial pattern, with pie diagrams representing the proportions of eggs laid on each host genus at each site. Across those 50 years, we've also observed a temporal pattern: six independent "host shifts," in each of which a butterfly population has changed its diet. The current paper describes just one of those six. The Schneider family, for >100 years owners of Schneider's Meadow in Carson City, Nevada, inadvertently set a trap for the butterflies by providing a novel resource, an introduced European plantain, so wonderful that the insects evolved complete dependence on it, whereupon the Schneiders snatched that resource away, causing local extinction of the checkerspots. Evolutionary athletes though these butterflies be, they can't evolve as fast as humans can alter habitats. The collage below shows our imagination of a female Edith's checkerspot in Schneider's Meadow, asking herself which of the host-plants she perceives is the "poison'd chalice:" the exotic plantain (top) or her still-available traditonal host, Collinsia parviflora. 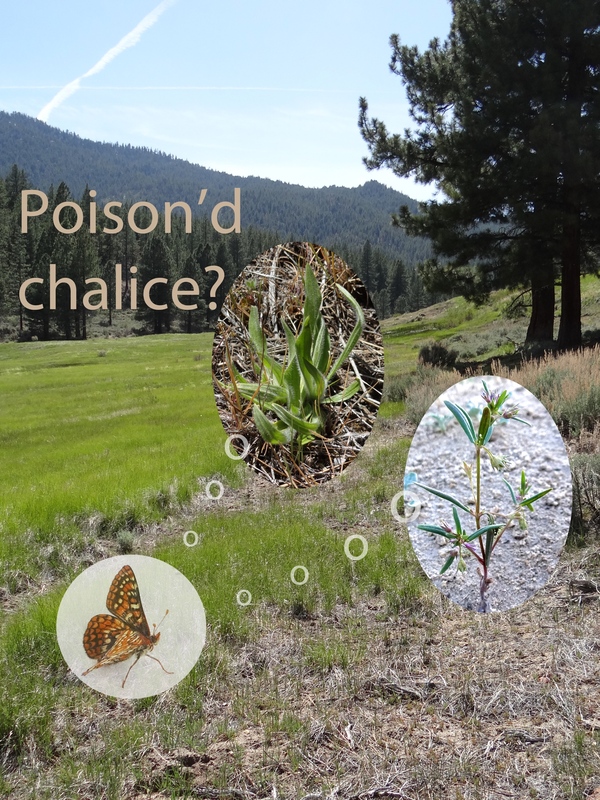 Our study shows that, eventually, all of the butterflies chose the chalice, leading to their demise in 2007-8. A few years later, in 2013-4, checkerspots that had not undergone this bout of anthopogenic evolution recolonized the site and the host shift reversed itself, setting the stage for a potential repeat of the anthropogenic evolutionary cycle. I was lucky to hit such a sweet spot with Paul, but there's a serious moral here for starting PhD students. Before approaching a potential supervisor, educate yourself about their work, then explain why you're enthusiastic about it and how you perceive that you might build on it. This might seem obvious, but, surprisingly, it's rarely done. A second moral that springs naturally from our paper is that field biologists should gather all the data that might conceivably be useful and hold onto it, because who knows what might be interesting in decades to come? One final moral: embrace the unexpected. Our 2014 field notebook still contains the pencilled triple-pejorative: "@#*%! @#*%! @#*%!". Our intent was to search the habitat and confirm that the butterflies were locally extinct, so we were instantly horrified to find them obviously very un-extinct. The recolonization seemed at first to spoil the storyline of our planned MS to Nature. But you'll see, I hope, that the paper is all the more interesting for including this observation. It was only the unexpectedness that gave us the opposite impression. I'm reminded of the time when a grad student admitted to throwing butterflies in anger after they failed to behave as theory predicted. As soon as he had done so, another student felt released to confess to exactly the same butterfly-punishment. I wish to assert categorically that neither author of the current paper has ever thrown a butterfly in anger. We respect their right to be their wonderful selves. In fact, we like to help them. In apparent recognition of this, my student Chris Thomas (nowadays Chris Thomas FRS) began his PhD defence in the late 1980's with characteristic sarcasm: "When he was twelve, Mike Singer discovered how much nicer it is than sticking PINS in butterflies to HELP them to find places to lay their eggs…" I won't add what he said next, I'll leave it to your imagination (those of you who know him will imagine that it might not have been laudatory). However, taking his comment in a positive spirit, I've added recent photos of the still-married Parmesan and Singer HELPING twenty Euphydyryas aurinia to find mates. Easily done, as you can see. Thanks from me & Camille to Paul, Larry and to our subsequent cheerful co-conspirators in Californian Euphydryology; especially Kelly Agnew, Alison Anderson, Davy Boughton, Alexa Carleton, Ellen Crocker, Ahmar Hashmi, Duncan Mackay, Jim Mallet, Sterling Mattoon, Lindy McBride, Sasha Mikheyev, Dennis Murphy, David Ng, Rosario Norzargaray, Chris Thomas, Sarah Thrasher, Dan Vasco, Brian Wee & Ray White.